We have less than a month now before the first race on May 5th, so things are getting frantic. 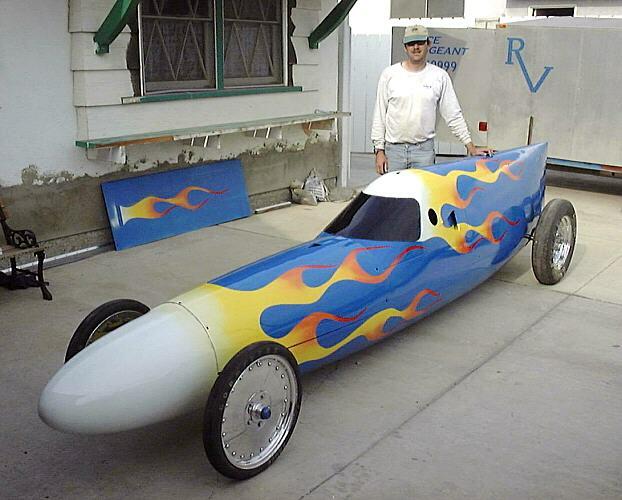 Alan and I went down to San Diego again on Saturday to finish the paint job. Unfortunately the weather gods didn't play along. If you think washing a car is a sure cause of rain, try painting one. After starting the year with 2-1/2 months of drought, So. Cal. had 4 weekends in a row with rain. Our first task was "wet sanding" the clear coat which is actually OK in the rain. But by early afternoon it was obvious that it wasn't going to clear up in time to paint that day. Rather than paint in the rain, we did a number of other tasks, like searching for the missing front axle kingpins that had been missing for a month. After searching every box of parts, and every corner of Mark's garage several times, Mark moved his solvent tank to look behind the work bench, and suddenly it dawned on Mark and I, that I had left them soaking in the solvent. D'oh! Then we started assembling the new rear axle pieces only to find a serious clearance problem with the new brake taper-lock that Mark needed to grind out, so we called it quits early, hoping for better weather on Sunday. Sunday dawned bright and an hour early thanks to daylight saving time, and we drove back to Mark's hoping we could finally be done with the painting. San Diego had scattered clouds, but was surprisingly warm so we quickly got to work, and had 2 more coats of clear on the car by lunch time. At last the painting is done! Mark spraying the last coat of clear gloss inside the "Plastic Palace" paint booth. 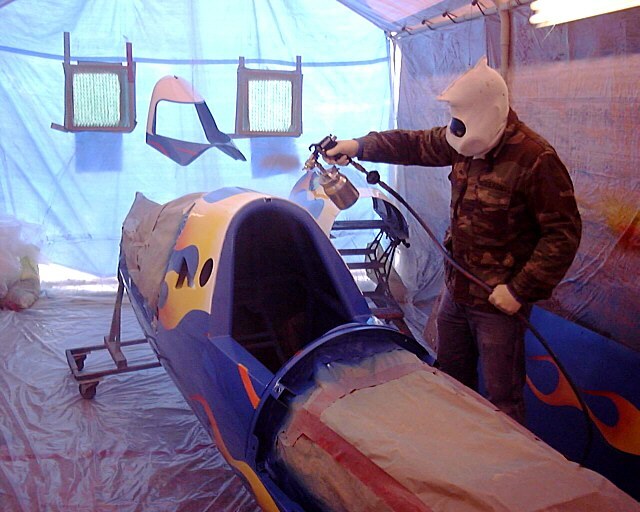 After lunch, the coats were dry enough to pull the car outside, and we were finally able to disassemble the paint booth, and pull all the masking off the car. Then came the tedious steps of putting the wheels and tires back on. The front axle got all new bearings which is a messy, but easy job. The rear axle was harder and all three of us struggled to get it re-assembled. But, by Sunday evening, it was back on it's wheels, just in time for a few pictures before sunset. The car back on all four wheels for the first time in months. Alan and I took the canopy and related pieces home to assemble them. With the car back in the garage, and opened up, Mark will start re-assembling what he can. Next weekend is shot, so it will be April 21st before we all get back together. We won't have everything finished that we'd like before the race in May, but we'll be there.